Aluminum is a beautiful milky white metal looking much like silver. 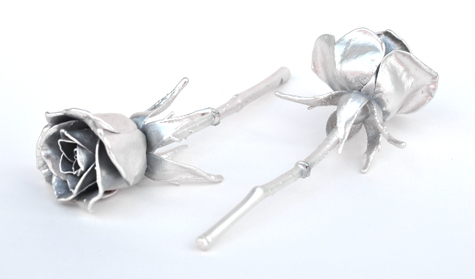 These small real roses preserved to last forever and covered in a layer of real aluminum. Each rose is made stiff and strong by the process so it is not too fragile - they are more like a small statue with a real, unique rose inside. These roses are about 5 inches long. 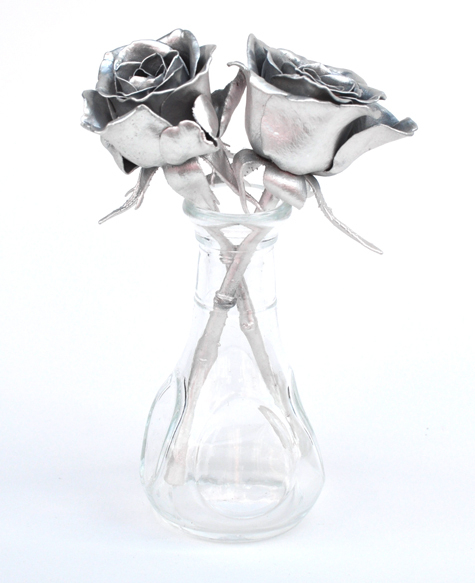 The perfect gift for the "Aluminum Anniversary" - traditionally the 10th wedding anniversary or anytime you want to give a unique gift of flowers that last. All of our products include a 45 day full refund guarantee & FREE SHIPPING on U.S. orders over $100. Up to 42 characters. Does not delay order.